A new fighter aircraft which staff hoped would safeguard the future of a Cornish RAF base is to be deployed in Scotland instead. 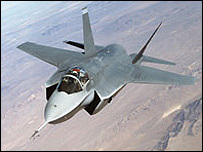 RAF St Mawgan near Newquay had been named as a possible base for the new Joint Combat Aircraft (JCA). The JCA, which will replace Harriers, will be based at RAF Lossiemouth. It was hoped that if the aircraft came to Cornwall it would help keep the base open and safeguard the future of loss-making Newquay Airport. St Mawgan was one of eight stations originally considered as a possible home for JCA, which is due to come into service in about 2012. Armed Forces Minister Adam Ingram announced on Thursday that the JCA and the Nimrod MRA4 aircraft would be based at RAF Lossiemouth and RAF Kinloss. Mr Ingram said St Mawgan was not selected because a business study demonstrated it was an expensive option. "In the light of my decision on JCA basing, I can now confirm that there is no long-term RAF strike command requirement for the airfield. "We shall therefore be considering alternative defence uses or possible disposal," he said. RAF St Mawgan, which operates largely as a search and rescue base, with three Sea King helicopters, is due to be mothballed in 2007. However, Newquay Airport relies on St Mawgan for the maintenance of the runway. The MoD also provides air traffic control and fire support at Newquay Airport, which is expected to lose £1.5m this year. BBC South West business correspondent Neil Gallacher said: "The worst case scenario is that Newquay Airport couldn't survive without the MoD. "But there's huge demand for civilian airport growth everywhere in the UK. "In the long-term, the airport has got a future - if they can find a way to free it up to get private sector investment in there. That probably is the most important goal." Scottish Liberal Democrat Michael Moore said that while the announcement would be welcomed by communities in his constituency, many in Cornwall would be very disappointed. He asked what specific measures would be taken by the government to help the Cornish economy. Mr Ingram said ministers would seek to minimise adverse effects as much as possible.